​You’ll agree that we are all scared of something and we also know that the only aim of fear is to stop us from achieving and actualizing goals. Do you think we have reasons to be scared? Yes of course. But i suggest we see fear as a huddle we must cross to attain higher heights. Often we slow down the pace at which we strive, for reasons we might not be aware of. Perhaps we fear the outcome of our success or we fear who we will become when we succeed, or maybe because we fear we may feel uncomfortable at the top or we might not be able to fit in with our friends and family. 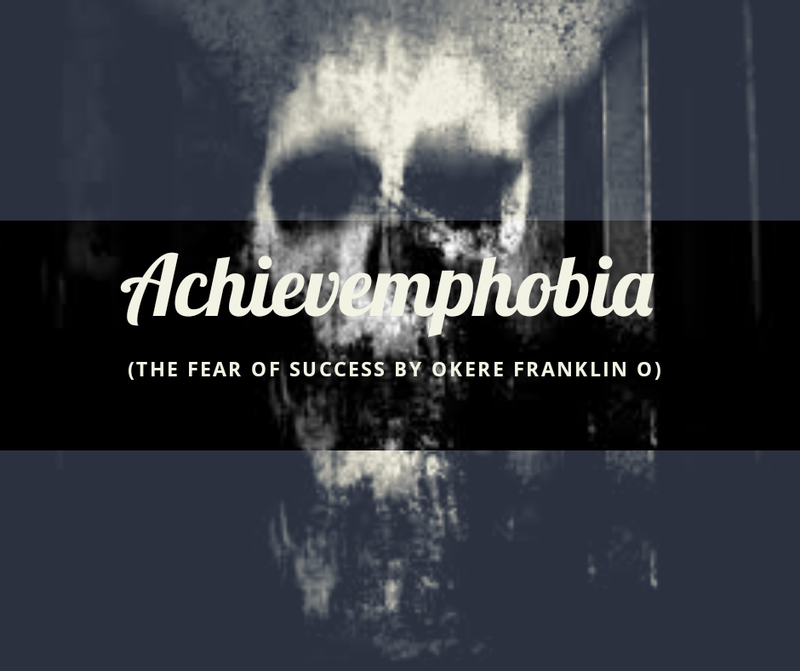 Subconsciously or otherwise, a majority fear success and this fear is refferred to as ACHIEVEMEPHOBIA. “The fear of success” is also regarded as the “Jonah complex”, it got it’s name from a character in the bible; Jonah son of Amittai who who was sent by God to prophesy the destruction of Nineveh but tried to evade the divine mission. With the help of my team, I’ve been able to pull some stunts. A year ago, we were able to establish of a fitness club in my school “TeamOfUs Fitness Club” and coincidentally today 7th of August, 2018 marks her one year Anniversary. We had our fears and were uncertain but here we are celebrating its one year Anniversary. To remain productive, we must not sit around postponing new tasks and dwelling on past glory. Accomplishing new tasks must be seen as a way of life and not a destination. › Disregarding the idea of setting goals. › Easily forgetting deadlines and not keeping to time. › Second guessing and doubting yourself. › Doing jobs you’ve outgrown, taking projects and opportunities only within your comfort zone. The value of a one thousand naira (#1000) is in the hands of the bearer i must say. Just like we act differently towards situations, in the same way we’ll handle businesses differently and don’t forget their are consequences to every action. Some persons fail out of fear, even when equal opportunities and encouragement is offered to them and their contemporaries. You remember the servant in the bible that buried the talent given to him by his master, whilst other servants invested and made profit out of theirs. His reasons being that he feared his master and felt he could never do well in his sight. Of course he was punished for that wicked act. No, nobody likes to fail unless their “fear of success” is greater than their “fear of failure”. To conquer any form of fear, we must learn not to fear loosing out but see it as a lesson and worthy experience. “We are powerful beyond measure” Why fear our own power, when it can be uses to our advantage. Knowing how much the world needs productive people, if we continue to thinking lowly of ourselves we might end up failing inwardly before we even get a chance to show our Limitless selves to the world. There are no limits to what the human mind can achieve, but first you have to bolden up then put your mind to a test. Sometimes, the reason we make average results isn’t because we lack understanding but because we make late preparations and let procrastination gain the greater part of us.. There are lazy days, but everyday is a lazy day only for a lazy persons. Flee from friends who don’t encourage you or share in your passion, some supposed friends can’t handle it when you try to take on tasks they failed at or considered difficult. Don’t get too attached or let yourself get emotionly stranded while hoping everybody will support you, be ready to walk in the storm alone and be ready to come out well. Deeds are far valued than intentions, so just like the 2008-2009 Rotary International theme, “make dreams real“. – You must expel every form of negative thoughts and second guessing (“can i do this?” “Do i have what it takes?”. “oh, i can never be better”. “But Mr A does it best”. “who am i to do better”) be your best critic but never fail encourage yourself. Think about situations that disapprove your fear, (“I’m a winner” “I can do this” “it is safe to win”). No matter what the situation is, remain positive in your thinking. – Casting your mind back to the achievements you’ve made in the pasts, regardless of how big little it may seem could be all you need to fire up and get back on track. Listing them could further serve as a reminder that you can do whatever you put your mind to. – Putting down how you feel on black and white will help you gain clearer understanding of your fear and also handle it. Journaling has proven to be a good means to expurgate innermost feelings and thoughts; (“what I’m i supposed to be doing?” “How do i deal with my fear” “how much have I done and how much more do i need to do”). Gradually you will feel less anxiety and unshackle your mind from the grip fear. – Take advantage of opportunities, but be sure not to put all your fingers in your mouth at the same time. Taking on more tasks than you can accomplish at a time could scare you from completing even one out many. It is in your place to create a balance to your life. People’s mindsets are the causes of burnout not success. – If your Achievemphobia is threatened by making changes, then it’s time to start taking baby steps towards making changes and beung comfortable with it: You could start from changing your approach towards people and things, the way you dress, going to a different Restaurant for your meals etc.. Getting too accustomed to a particular way could sometimes scare you from wanting to make changes. – Understand self-sabotage and how destructive it could be while trying to overcome your fear of success. Be where you need to be, when you need to be. Keep to your schedules especially when you have appointments as important as, job interviews, scheduled gatherings, distract yourself from objects and activities that doesn’t support your current goal. – Think of Success as a journey and not a destination, life could be good today and bad the next day but it doesn’t mean it’s the end. We must continue to strive everyday, aiming to win of course but when things don’t work the way we planned be sure to learn the lessons but also be consoled that more opportunities would come. Give up your fears, you can never fly if you are too scared to jump. Soar and make sure nothing stops you. I’ve really postponed reading this but it seems I’m reading it at my own right time cos I really need this now. Nice piece. Actually took my time to go through it, and it was worth it! I’m happy you enjoyed the read. I just picked out the need for a team. It can help you going when the chips are down. “There are lazy days, but everyday is a lazy day only for a lazy persons”. It’s a pleasure sir, thanks for reading.